Soak 1 cup sooji in water just enough to wet all the grains well. Let it soak up for 10 minutes. Once the grains turn soft, knead the sooji well by rubbing the dough to the vessel with your palm. 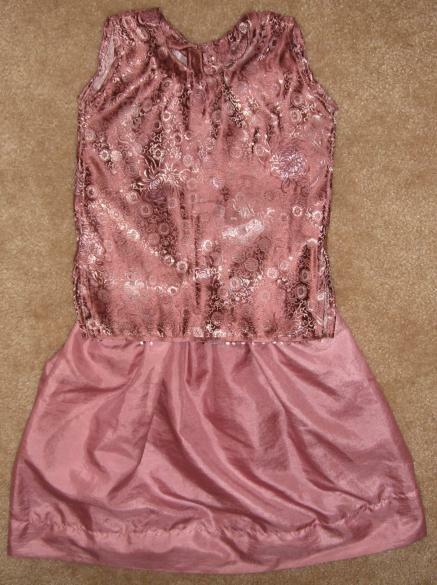 It turns to a creamy while color. Add 1 cup maida, 2 tbsp atta and 1 tbsp rice pwd and salt. Add enough water to make a stiff dough. Roll into small round bite-sized pooris and deep fry them in medium – low heat for about 7-8 minutes, 3-4 minutes on each side. If none of the poories in the 1st batch puff up, add little more water to the dough and soften it up. Most of my poories puffed up and stayed crisp. Needless to say – I was elated! Grind the leaves and chillis in a blender with water. Strain out and add the dry ingredients. Add about 5 cups of water, salt it up with kala namak / black salt and add lime juice. Taste it and add water or salt as required. 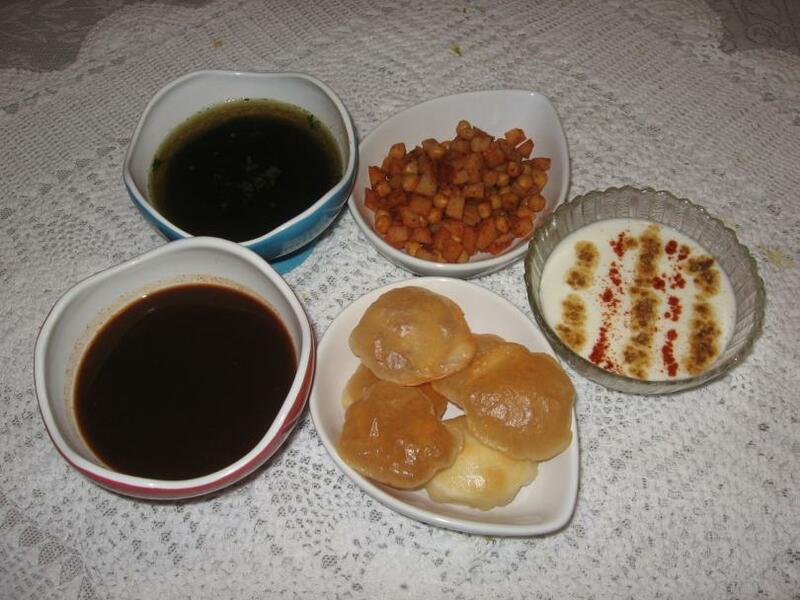 Intead of the dry ingredients, you could also add a couple spoons of pani poori masala. Pani should be served cold. Refrigerate before-hand or add ice for immediate use. Boil Tamarind and Jaggery in water till the raw smell goes. Add the dry spices and strain it. I like the chutney a little thick. Add more salt or water if needed. I like to make extra chutney and store it in an empty ketchup bottle for later use. This goes well with samosas, puffs, bread rolls, cutlets etc. Boil the Dates and tamarind. Add the dry ingredients and strain. Cut potatoes to small pieces and boil in salted water till done. Drain and mix it with the chick-pea. Add salt and chilli pwd to taste. 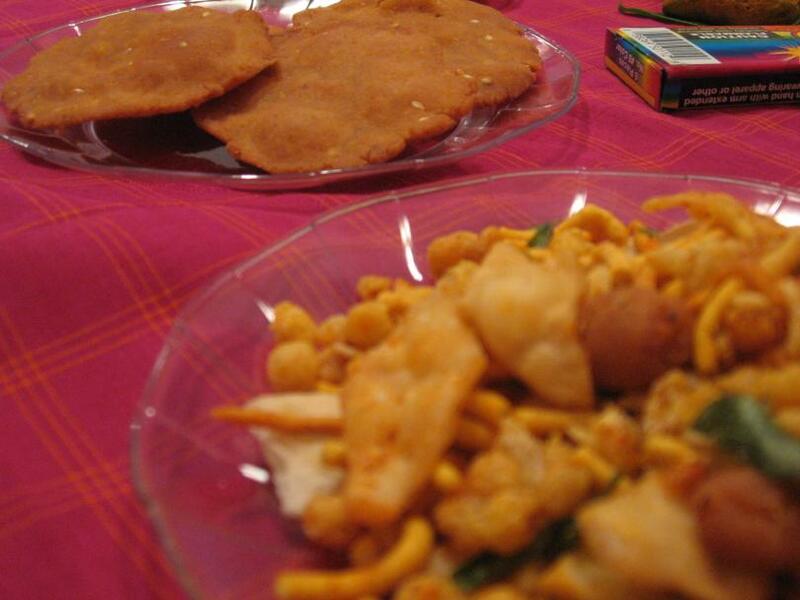 To assemble: Break the thinner side of the poori with your thumb. Fill 3-4 pieces of the potato mixture. Pour a little khatta-meetha chutney. Dip it into the pani and fill it up to the brim. Put it into your mouth as it is without biting. Enjoy! So? what is the curd is doing in the photograph? It is an answer to another question. What do we do with the poories that did not puff up? First, we start by changing their name to papdi and then make a quick papdi chat. Dip 5-6 papdis into the pani and arrange it on a plate. On each papdi place some of the potatoes. then pour some salted, churned curd. Drizzle the khatta-meetha chutney on top. Garnish with little chilli pwd, jeera pwd and chopped cilantro (Sorry, no photographs here). Any guesses on what this is all about? Yeah yeah…..I know I have a bad hand-writing. Happy Deepavali – Good wishes and a request! To all Tams out there – “Deebavali Vazhthukkal – Ganga snanam aacha?”, to the Hindi speaking junta – “Diwali ki shubhkamanayen” and to the Gujus – “Saal Mubaarak”. Since, these are the only three language I can communicate in, its “A very Happy Diwali” to the rest of you. Now, would you do me a favour? Could you leave me a comment wishing me back in your mother tongue and also specify the language you speak (It doesn’t necessarily have to be an Indian language)? This will serve as a reference for me and many of you who would like to leave comments to our fellow-bloggers for the next year. 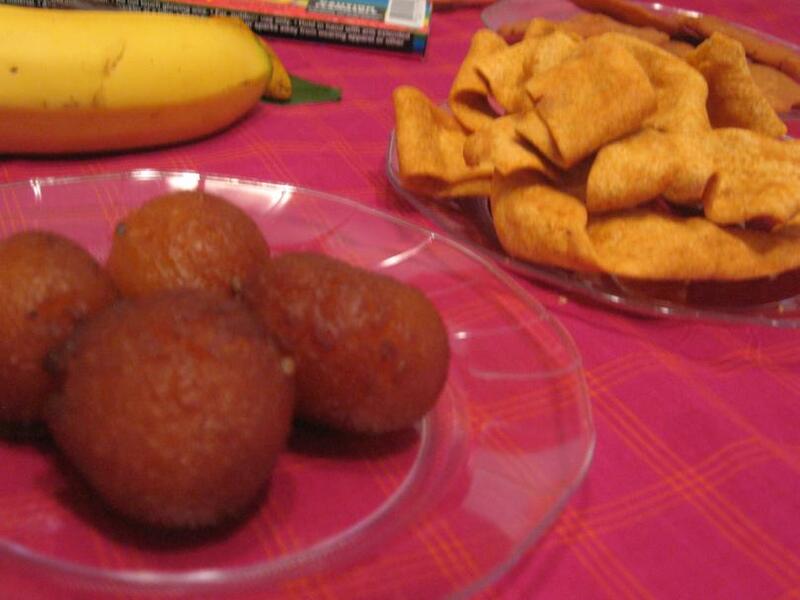 And my entry to JFI for Diwali treats – Deepavali marundu (marundu is Tamil for medicine). 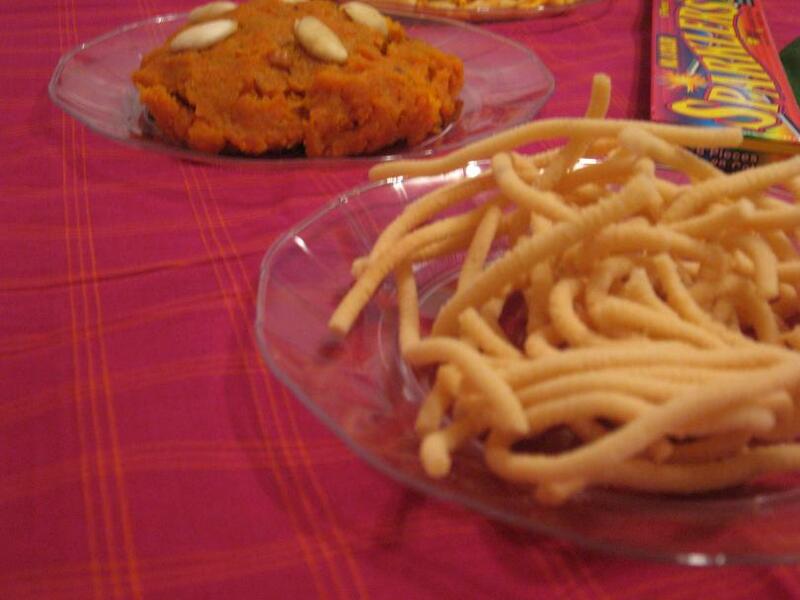 The bakshanams for diwali can vary every year, but traditionally, one item that is always made at home is the marundu. 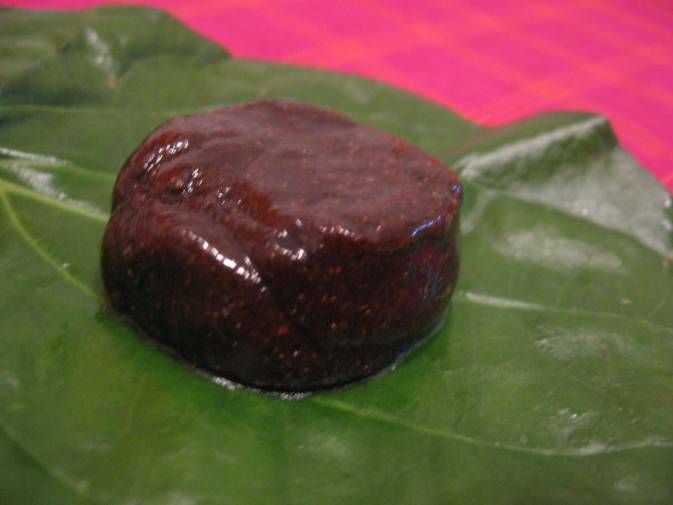 A small ball of this sweet and spicy concoction is important to prevent/cure the indigestions caused by the different treats you gobble up at a steady rate through-out the day. (p.s this lets you get out and enjoy the fireworks and not visit the restroom more often than necessary; – sorry- just had to put this in). Anyway, jokes aside, here is the recipe for Deepavali marundu. I have the names of ingredients in Tamil and will soon find out the names with which they are more commonly called and also post a picture of all the herbs/barks/spices. Put the dry ingredients in a cloth/paper towel and beat with a hammer. Then dry-grind the ingredients. It is important to beat it up first since some of them are too hard to be dealt with the grinder as is. Sieve the ground mixture and again dry grind anything that did not pass through the sieve. Repeat the process 2-3 times. Mix the sieved powder with a little bit of water to get a lump. Now, grate and measure up an equal amount of jaggery. In a pan, put a tbsp of ghee and the jaggery and heat till the jaggery dissolves fully and bubbles up in the sides. Add another tbsp of ghee and add the marundu ingredients. keep stiring till it leaves the sides. Add another tbsp of ghee if it sticks to the bottom during the stiring process. Before taking it off the stove add the honey. The marundu will harden up after cooling as any other sweet. So make sure you take it out what it is still soft and workable. I know what most of you are thinking right now. Is it absolutely necessary to use all the above ingredients? Well no. I have a very simple recipe for making it with what you would have handy all the time. Mix the ajwain and pepper, powder and dry roast for 5 minutes. Add 2 tbsp ghee to a pan and roast ginger. Mix the powdered indredients to the ginger and grind. Do not sieve. Rest of the process is as above. Add jaggery in equal amout to the ground mixture. You could use any other spice (except dry ginger) that is called for in the original recipe if you have it in hand. Simple? Rest of the recipes will follow………. A week’s left and preparations have begun. 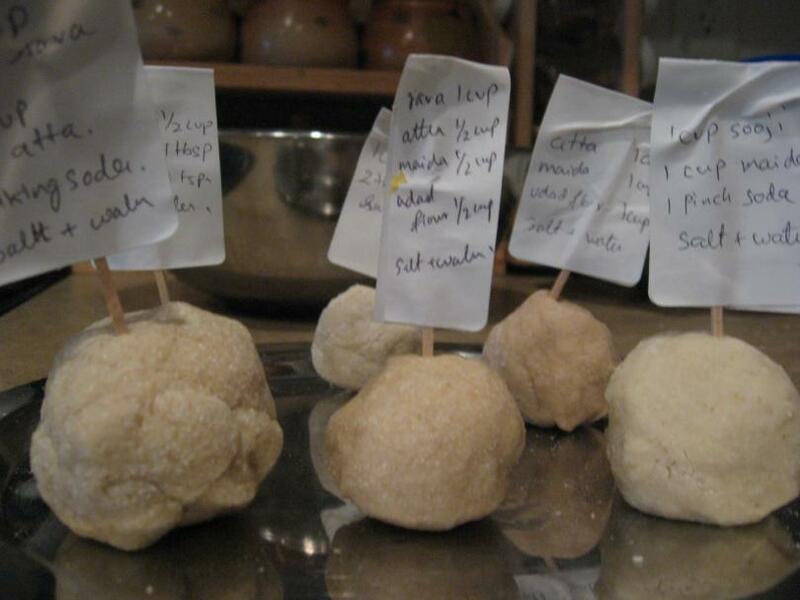 I have a visit pending to the indian store – besan, udad flour, moong flour…the list is long. A visit to the normal grocery store, fire-works purchase, some new clothes to be bought – there’s lots going on in my mind lately. My in-laws are visiting and I have made my MIL promise me that she would be steering clear of the stove and I would be handling anything that needs to be done on the stovetop. Of course, the recipes come from the wise and experienced. You have no idea what it took to get these words out of her – ‘A great achievement’, – my husband says. We have heard from my MIL that her dear husband is a good cook as well, though we have never had the opportunity to taste his creations. Hence, this year my FIL has promised to unveil his recipe for Badam halva. I have offered to be his assistant for the task he undertakes after about 30 years! I have been keeping pretty busy at work and at home. Hence, after a short silence, I will be back with a bang on Diwali day. Till then folks, have fun shopping and preparing for the festival of lights! What starts with a B and is a native Texan? Bush, yes. But, we are not talking about people here. Let me reframe my question. What starts with a B, is beautiful and is a native Texan? This is my entry to the Flower Fest – The A – Z of Flowers hosted by Manisha. I am a day late and I hope my entry can squeeze into the final round-up.Blue bonnets start blooming in early spring and blankets of these wild flowers can be seen throughout central and south Texas from late March to early May. It is named for its blue color and the resemblence of its petals to a woman’s sunbonnet (worn as head coverings during the 18th century). They typically grow about 1 feet tall. Seen below are pictures taken by a fellow-student Tim, at the Pickle research campus at Austin,TX in spring 2003. Come March-April and there is a rage of colours all around the campus – blues, reds, yellows – a magnificent treat for the eyes!!! One of my favourite cookbooks DAKSHIN, by Chandra Padmanabhan had been lying on the counter- top without being used for a long time. I got this as a gift from my MIL 2 years back and have tried various recipes from this book with wonderful results each time. This recipe for Mysore sambhar always caught my attention, since this was a new recipe to me. The only reason I had not tested this was because there was no tamarind in the list of ingredients and sambhar sans tamarind……hmmm? Yesterday, however I decided to go for it. I couldn’t help but add a little bit of tamarind never-the-less. I was quite impressed with the outcome. Though, the tamarind did add that little bit of taste that I like, I am pretty sure the recipe would have been as good if not better even without it. Curry leaves – 5-6 nos. Cook the dal and soak the rice in water for about 15 minutes. Cut vegetables to about 1 inch size and boil in water. Add the tamarind and salt when the vegetables are half cooked and let it boil up together till the vegetables are fully cooked. Make a fine paste of all the ingredients listed with minimum water. The original recipe did not have methi (fenugreek) seeds, but I decided to add some for the flavour. Add turmeric and the paste to the veggies and let it simmer up for about 5 minutes on medium flame. Next add the dal and cook the sambhar for another 3-4 minutes. Temper with Mustard, cumin, red chilli and curry leaves and serve hot with rice.